Eco-friendly starts right here. Green Toys are made from 100 curbside collection recycled plastic. Every family plays their part in the recycled circle. 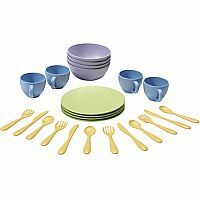 Green Toys Dish Set contains 4 plates, 4 cups, utensils and 4 bowls. Made entirely in the United States, and made for fun. 24 pieces. No BPA or phthalates. Dishwasher safe. Measures approximately: 12.00 x 9.00 x 3.00 inches..